This is a hillside course, which used to be a rubber plantation. The fairways are gently sloped and as they get closer to the greens, the narrower they become. There are many blind shots off the tees and you are forced to target shots carefully on many holes. A beginner who can’t hit straight might have a bad score. However, the yardages are short overall with only one par 4 with over 400 yards, an advanced player can expect a good score. A straight, short par 3. The shot is downhill and its landing area is narrow with well-placed trees on both sides. Accuracy off the tee is a key to success on this hole. If you hit an errant tee shot, you could end up with a bogey or double bogey. You don’t need to use a driver and even if you use a fairway wood off the tee, you can use a wedge or a short iron on the approach short. If your tee shot is successful, a birdie is achievable on this short hole. A double dogleg with a slight dogleg to the right followed by a slight dogleg to the left. A lake on the right corner comes into play on the tee shot. The second shot and thereafter are gently uphill. The green is slightly elevated and protected by bunkers on both sides. A straight hole with the sharp downhill tee shot. A long hitter can’t use a driver as a river crosses the fairway 270 yards off the tee. To use a fairway wood on the tee shot is recommended but it must be hit precisely as the landing area is tight and mature trees with lots of branches line the fairway. This hole is not that difficult as the remaining yardage on the second shot is short. A gentle downhill, sharp dogleg to the left. You should aim for the left side of the fairway bunker on the tee shot. The second shot is over water with the front of the green facing the water, so a full carry is needed. A slight downhill par 3 onto an island green. A long & almost straight hole with a tremendous downhill second shot. The landing areas are narrow, so accuracy is required. 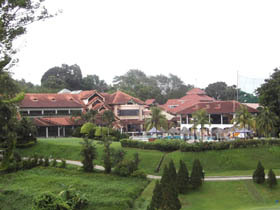 It takes 30 minutes from the Airport and 40 minutes from by Central Singapore by car. Visitors can play when there are tee times available if you book 2 days ahead.